Armagh City, Banbridge and Craigavon Borough Council will be holding two public meetings in the Brownlow area of Craigavon this fortnight as it forges ahead with implementing its play strategy and delivering its ambitious programme of improving outdoor play provision for all children across the borough. With a public meeting organised in the Moyraverty and Tullygally areas, residents in each locality are encouraged to engage with the council and play an active role in bringing exciting play development proposals to fruition. 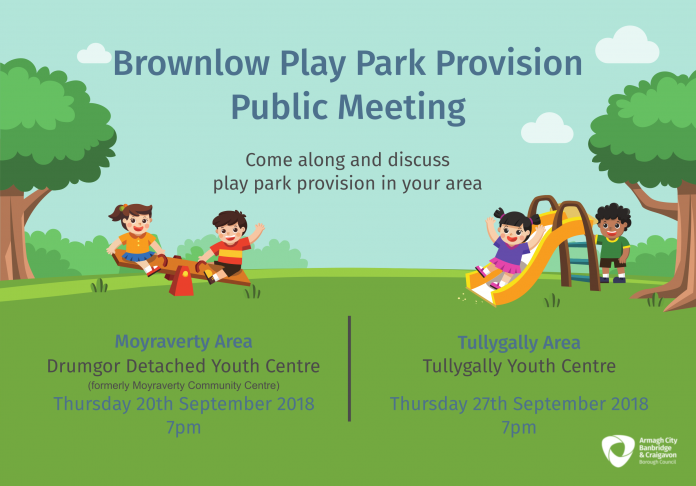 The Moyraverty play park meeting will be held on Thursday 20 September at 7pm in Drumgor Detached Youth Centre (formerly Moyraverty Community Centre), followed by the Tullygally play park meeting on Thursday 27 September at 7pm in Tullygally Youth Centre. These public meetings present a unique opportunity for members of the local community to share their views on site preference, design and layout of the play park along with choice of play equipment. The council is committed to ensuring its extensive portfolio of play parks are maintained to the highest standards, developed to meet local need and well designed to provide quality play experiences for children in all parts of the borough.